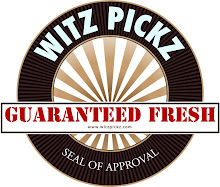 Witz Pickz: Witz DOESN'T Pick: "Only the Good News"
Person: Did you hear about the down-swing in the Asian markets that could potentially cause millions of people in the US to lose their jobs? Witz: No, but did you hear about how baby seals are adorable? Beyond that, how do you have "Only the Good News" on a radio station. What about the fact that TRAFFIC exists?? "For those of you taking 405...take this time to think about all the people that love you! For those of you NOT taking 405, realllly good decision-- we can't say why." Or maybe just, "There's absolutely no traffic on Quarry Road today!" If it's raining outside, do they just skip over weather? How do they judge if that's good news or not-- maybe there's a drought or someone wanting to watch a movie and not feel guilty for staying indoors? "It's a great day to not have to go outside!" You know who listens to the station with "Only the Good News?" Everyone who's going to die in the event of an emergency. I'll be hearing about the Earthquake or the Tornado or the Alien Invasion and packing my things and getting out of town while Good News Gary gargles a tsunami. Country at 93% Employment! GREAT! Ohhhh wait, that means we're at 7% unemployment, which is actually considered quite high! Thanks for manipulating statistics-- that's not good news, that's just you thinking I'm dumb. Walmart Posting Record Sales! Phew! I was worried the large mass corporation that treats their employees the worst and sells primarily to poorer people would go under! That sounds great for Walmart, but I'm not exactly sure how it helps anyone else. Luckily, they're posting record sales, which means more people feel they have to shop at Walmart in order to afford their lives, which means more people are getting poorer. That's one step above saying, "Food Stamp demand at all time high!" As Sparks Gal says, "How does their announcement that they are hosting a Rod Stewart show at Quilceda Creek Casino constitute 'good' news? And how will they report a serial killer on the loose? Maybe in terms of 'the victims have all been unpopular, thus far'??" If 95.7 was being remotely facetious, I could understand, but they mean it and that worries me. Are people that dumb? That fragile? If so, I plan to rob them. Again and again. "Who's breaking into my house? Who's there??" "It's ME-- the tanking U.S. economy!"